Brookings recommendation that MEK be removed“from the list of foreign terrorist organizations”would eventually be fully realized by 2012 – spearheaded by lobbyists led by prominent US politicians and policymakers including US National Security Advisor John Bolton. Admissions to the deaths of the Rockwell International employees can be found within a 2011 report written by former US State Department and Department of Defense official Lincoln Bloomfield Jr. on behalf of another lobbying firm – Akin Gump – in an attempt to dismiss concerns over MEK’s violent past and how it connects to its current campaign of armed terror. The State Department’s Country Reports on Terrorism 2009 document says that the MEK killed the deputy chief of the US Military Mission in Tehran in 1973, two members of the US Military Assistance Advisory Group in 1975, and two employees of Rockwell International in 1976, and that it claimed responsibility for killing an American Texaco executive in 1979. The US State Department admits that the organization carried out terrorism in the past and continues today with abuses toward its own members. And as US policymakers within the pages of Brookings papers admit, the entire campaign aimed at delisting MEK in the first place was to legitimize the organization’s use as a militant proxy against Iran – a role that will most certainly violate MEK’s supposed“renunciation of violence” and contravene the grounds upon which MEK was delisted as a terrorist organization by the US State Department in the first place. Considering the undeniable terrorist nature of MEK past, present, and Washington’s own admitted plans for its terrorist future, the troubling nature of John Bolton’s advocacy for the group comes into full focus. This is particularly so within the context of Bolton’s new role as National Security Advisor. Bolton, who has attended the annual NCRI event for a decade, cited Iran’s military intervention in Syria, in maneuvering in Iraq, and its support for Hamas and Hezbollah terrorists and for Houthi militia in Yemen. Supporters view the NCRI and affiliated People’s Mujahedeen Organization of Iran (MEK) as a viable opposition to the clerical rulers in Tehran, and praise it for exposing the regime’s covert nuclear programs. Detractors view with suspicion its history of support for the regime of Saddam Hussein, and what critics have described as cult-like behavior. 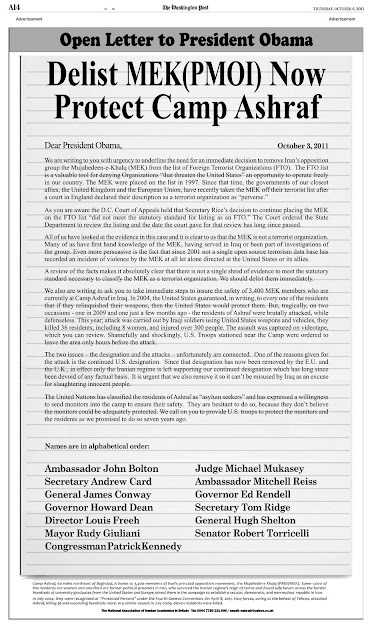 We are writing to you with urgency to underline the need for an immediate decision to remove Iran’s opposition group the Mujahedeen-e Khalq (MEK) from the list of Foreign Terrorist Organizations (FTO). The 2011 adwas signed by John Bolton along with other prominent US politicians including Howard Dean, Rudy Guiliani, and Tom Ridge. Since MEK has only been removed from the US State Department’s Foreign Terrorist Organizations list since 2012, CNS, Foreign Policy, and the lobbying efforts of Bolton himself serves as evidence that Bolton provided support and lobbying services to what was a listed terrorist organization in blatant violation of18 U.S. Code § 2339A – providing material support to terrorists. Bolton’s speeches openly supporting MEK prior to 2012 are easily found online. 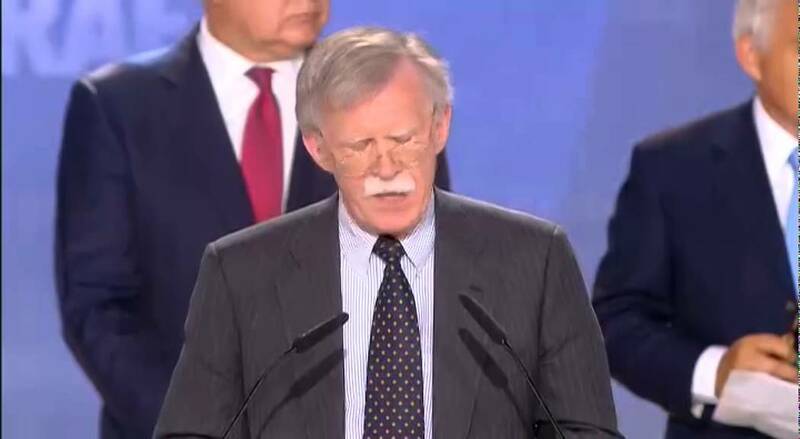 One published in 2010 features Bolton speaking in Paris openly advocating not only the US removing MEK from its Foreign Terrorist Organizations list, but also lobbying for US support to be provided to MEK and others in what he called the “Iranian opposition.” Since the 2012 delisting, Bolton has continued attending MEK events and advocating both support for MEK and openly calling for the US-led overthrow of the Iranian government. 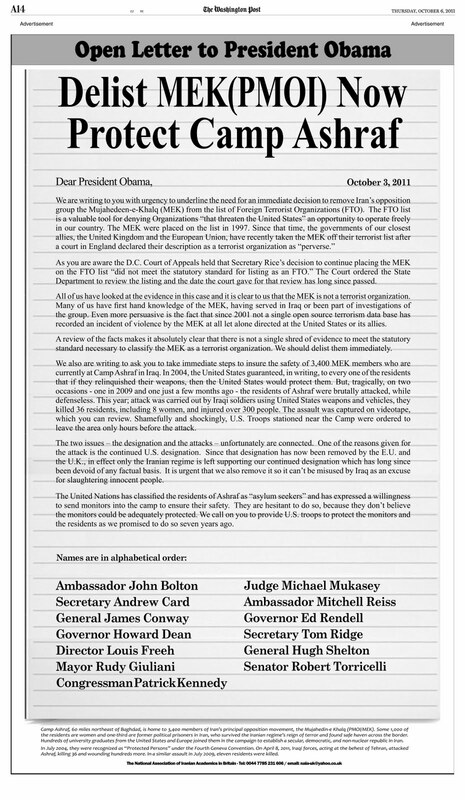 While some have attempted to defend Bolton and others lobbying for MEK claiming that MEK could not have been removed from the State Department’s list even if it was no longer a threat to the US without the aid of lobbying – it should be remembered that the job of adding or removing terrorist organizations from the State Department’s list is the responsibility of the Bureau of Counterterrorism in the State Department – not political lobbyists. The Bureau of Counterterrorism in the State Department (CT) continually monitors the activities of terrorist groups active around the world to identify potential targets for designation. When reviewing potential targets, CT looks not only at the actual terrorist attacks that a group has carried out, but also at whether the group has engaged in planning and preparations for possible future acts of terrorism or retains the capability and intent to carry out such acts. Clearly – however – the presence of immense lobbying campaigns like those led by Bolton on behalf of MEK indicates that the State Department’s list is dictated by political motivations, money, and lobbying, not independent analysis provided by US security and intelligence professionals either in the US State Department or elsewhere within the US government. Furthermore, it is clear by the US State Department’s own criteria that MEK is still very much a foreign terrorist organization. According to its own criteria, any organization that is even planning or preparing for possible future acts of terrorism, must be included on the list. US policymakers and even John Bolton himself have openly stated that MEK will be used as an armed proxy against Iran. A National Security Advisor openly guilty of violating US anti-terrorism laws having provided material support to a US State Department-listed foreign terrorist organization for years illustrates just how profoundly compromised US institutions are and reflects an agenda that not only exclusively serves special interests – but does so at the cost of the American people’s actual security. The National Security Council (NSC) is the President’s principal forum for considering national security and foreign policy matters with his senior national security advisors and cabinet officials. Since its inception under President Truman, the Council’s function has been to advise and assist the President on national security and foreign policies. The Council also serves as the President’s principal arm for coordinating these policies among various government agencies. A National Security Council that includes lobbyists representing terrorist organizations with American blood on their hands constitutes not only a dire threat to actual US national security, but global security as well. MEK terrorists backed by a nation possessing nuclear weapons and a history of provoking wars through fabricated evidence and staged incidents ensures that America’s foreign policy will continue to pursue destructive wars abroad at the cost of US treasure and blood and the resources and lives of nations the US sets its industrialized military aggression upon. John Bolton – however – is not the architect of the policy he has advocated for well over a decade. He is simply fulfilling what US policymakers themselves have meted out in the pages of US policy papers for just as long. These policymakers – in turn – are funded by American arms manufacturers, energy conglomerates, financial institutions, and other immense corporate-financier special interests. The Brookings Institution whose 2009 paper, “Which Path to Persia?” spelled out verbatim the steps Bolton has since undertaken with his lobbying efforts, has a long list of such corporate-financier interests underwriting and directing its work. Understanding that efforts to remove MEK from the US State Department’s Foreign Terrorist Organizations list and prepare them for their role as armed proxies against Iran transcended the administrations of George Bush, Barack Obama, and now Donald Trump exposes the continuity of agenda – regardless of who occupies the White House or US Congress – advanced by these unelected corporate-financier interests. 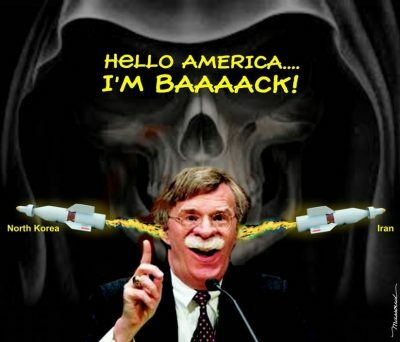 While exposing John Bolton’s complicity in the material support of egregious terrorists and his efforts to use them as armed proxies against Iran in a war he has attempted to promote and instigate for years is important, it is equally important to expose, confront, isolate, and extinguish the influence of the corporate-financier interests that have underwritten and directed Bolton’s efforts and the efforts of countless others working to drag the United States, its allies, and the rest of the planet into another destructive conflict. Tony Cartalucci, Bangkok-based geopolitical researcher and writer, especially for the online magazine “New Eastern Outlook” where this article was first published.